Captain Watson began his law enforcement career in 1997 with the Redlands Police Department and is a graduate of the San Bernardino County Sheriff’s Department basic academy class 130. In 2000, he became a patrol officer for the Ontario Police Department. 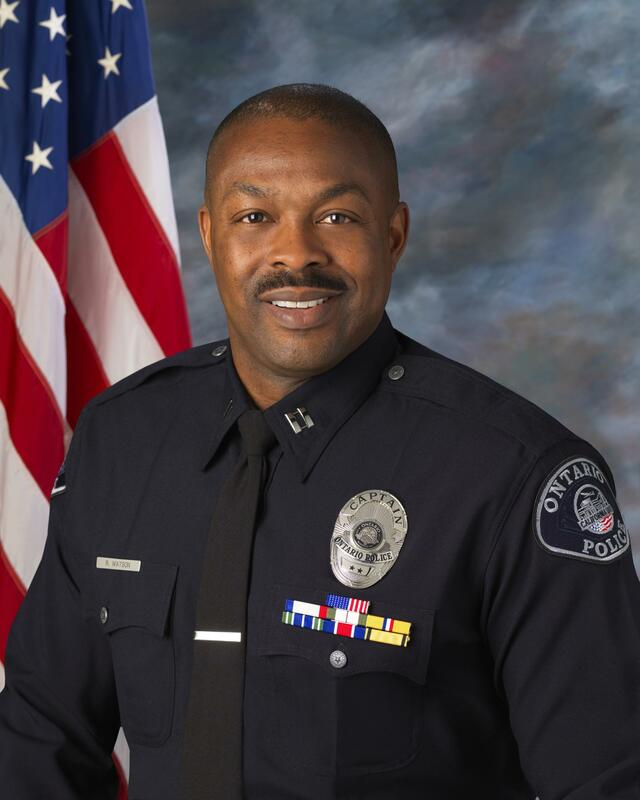 During his OPD career, Captain Watson has worked various assignments including the Ontario/Upland Narcotics Task Force, COPS, Crisis Response Team, Honor Guard, Field Training Officer, Ontario Mills Mall, and the Recruitment Team. Prior to becoming a police officer, Captain Watson was a member of the United States Naval Reserve. He is a graduate of Riverside Community College with an A.S. degree in Electronics Technology and California State University, San Bernardino with a B.A. degree in Management. In 2018, Captain Watson attended the California Police Chiefs Executive Leadership Institute. Captain Watson has held supervisory and command positions in the following: Field Operations, East and West Area Commands, Crisis Response Team, Police Explorers, Honor Guard, and the Personnel and Training Division. As the Field Operations Bureau Commander, Captain Watson works hand in hand with three Area Commanders. They are all committed and dedicated to improve the quality of life and economic value of those who live and work in the city. If you have any questions or concerns, please contact Captain Watson or your area commander.